Photo: Greater Manchester Fire and Rescue Service. Firefighters from Greater Manchester Fire and Rescue Service (GMFRS) took part in a major training exercise at their new training facility in Bury on 30 June. Crews had no idea what scenario they would face and needed to demonstrate extensive search and rescue skills in demanding, real-life conditions, along with partner agencies and neighbouring fire and rescue services. GMFRS Resilience Manager, Dean Nankivell, and his team spent three months designing and building the scenario, which saw search and rescue teams faced with a supermarket that had been demolished by an aeroplane. Dean said, “Our firefighters train every day for a variety of scenarios, but this sort of major incident training takes months to put together. These pre-planned, routine training exercises ensure our crews and other emergency services are well prepared to tackle major incidents. GMFRS’ Technical Response Unit crews used search and rescue dogs to help them search dangerous sites and find casualties that need help. 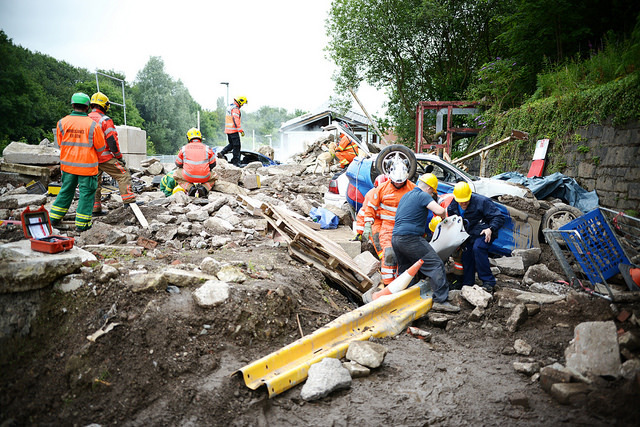 Station Manager and Incident Commander for the training exercise, Val Hussain, said, “Our search and rescue dogs can quickly survey the site to determine whether any live casualties are trapped under the rubble. The dogs allow us to search sites that are too dangerous to put people in and we can search a wide area of open land really quickly. The 24-hour, real-time exercise ran from Friday 30 June to Saturday 1 July, with Merseyside and West Yorkshire fire and rescue services also taking part, providing relief for the Greater Manchester crews. North West Ambulance Service and Greater Manchester Police were also involved. Fire and rescue service volunteers and support staff played the roles of casualties, walking wounded and worried bystanders. And, just like in real-life, the Salvation Army was on hand to provide food and drink for those taking part. The 10-acre site, which opened in March this year, is the largest firefighter training facility in the UK. It’s also open to visitors.